Step One: Write a letter. Be firm and sarcastic. Step Two: Just for sport, go ahead and close a credit card today. I’m gonna. I know some people live for black friday and the “bargains” that are so good that they can spend more money than they make. 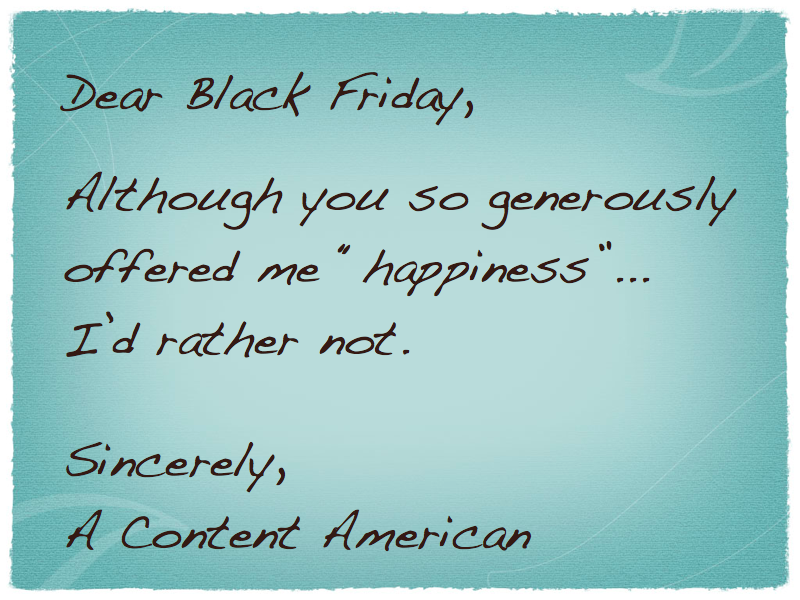 I refuse to herded, just like I refuse to capitalize “black friday”. Love it. I’d close a credit card if I had any to close! YEAH! HOW YA LIKE ME NOW, BLACK FRIDAY! Also, another one of my fave bloggers is taking it a step further! Kudos for not having any cards to close, friend! Closing one on Black Friday was bittersweet for me. I doubt this particular monstrosity of a bank receives many of THOSE calls on the busiest shopping day of the year…LOL! I love zen habits – always innovative and inspiring. During the holidays we focus our energy on our loved ones by showering them with love instead of stuff. It’s the way to go. A “cheap and creative” holiday post is on the schedule…stay tuned.